Multiplex assays can be defined as the type of immunoassay that employs magnetic beads for simultaneously measuring a range of analytes in a single reaction. Multiplex assays are considered to be derivatives of enzyme linked immunosorbent assay (ELISA). However, these are preferred over singleplex ELISA, owing to their advantages such as high throughput, greater output per sample volume, and increased efficiency. The global multiplex assays market is anticipated to reach US$ 4,277.31 Mn by 2026, expanding at a CAGR of 7.90% from 2018 to 2026. Expansion of the market can be attributed to the advantages offered by multiplex assays over singleplex assays, rising prevalence of infectious diseases and cancer that can be detected easily at earlier stages, government and private funding for carrying out research, and strategic acquisitions among market players to enhance the reach of the multiplex assay kits. However, the high cost of instruments used to perform multiplex assays, non-availability of diagnostic kits, and lack of skilled labor are anticipated to restrain the market. In terms of product, the market has been segmented into instruments, consumables, and software. The consumables segment has been further sub-segmented into reagents and kits, microplates and micropipettes, and others. Consumables was the dominant segment in 2017. It is anticipated to remain dominant during the forecast period. It is anticipated to propel at a high CAGR during the forecast period, owing to the significant increase in focus on research and development by major market players, which would lead to repeat orders for consumables, contributing to the rise in revenues. Among the consumables segment, the reagents and kits sub-segment is expected to account for a major share of the consumables segment, in terms of revenue, during the forecast period. Based on technology, the market has been classified into multiplex RT-PCR, flow cytometry, fluorescence, luminescence, and others. The flow cytometry segment dominated the market in 2017. It is anticipated to remain dominant during the forecast period. Robust expansion of the segment can be attributed to the ease of performing multiplex assays through this technology, which offers the flexibility of running a large number of samples simultaneously with accuracy. This, in turn, fuels the segment. Additionally, the focus on development of multiplex bead-based assays for flow cytometers propels the segment. In terms of type, the market has been segregated into protein, nucleic acid, and cell. The protein segment has been further sub-segmented into planar and bead-based. The nucleic acid segment has been split into planar and bead-based. The protein segment dominated the market in 2017. It is expected to expand at a significant CAGR during the forecast period. Expansion of the segment can be attributed to the increase in analyzing protein samples precisely and simultaneously for dynamic and static as well as predictive, descriptive, and biological research. In terms of protein segment, the bead-based sub-segment is anticipated to remain dominant during the forecast period, owing to its application in the analysis of various infectious diseases and autoimmune diseases. Based on application, the market has been divided into research & development, diagnosis, and others. The research & development segment has been further segmented into drug discovery & development and biomarker research & application. The diagnosis segment has been further sub-split into infectious diseases, autoimmune diseases, cancer, cardiovascular diseases, neuro-endocrine diseases, and others. The research & development segment is expected to expand at a notable CAGR during the forecast period, due to rise in focus of market players on investments in their research on multiplex assays. Moreover, increasing availability of multiplex kits approved only for research purposes and government and non-government funding for research aid in the growth of the segment. In terms of end-user, the market has been bifurcated into academic and research centers, biotechnology and biopharmaceutical companies, diagnostic centers, hospitals, and others. The biotechnology and biopharmaceutical companies segment dominated the market in 2017. It is expected to remain lucrative during the forecast period. Expansion of the segment can be attributed to the increase in focus on the establishment of biotechnology companies in emerging economies. Furthermore, increase in the number of biotechnology companies, globally, particularly in Europe and Asia, is expected to boost the segment. In terms of region, the market has been segmented into North America, Europe, Asia Pacific, Latin America, and Middle East & Africa. North America and Europe, cumulatively, accounted for over 68% of the market. They and are anticipated to remain dominant in terms of revenue during the forecast period. North America is anticipated to remain dominant during the forecast period owing to the presence of leading market players in the region, aiding in the easy and rapid availability of instruments and reagents for conducting assays and the strategic mergers and partnerships among players. The market in Asia Pacific is anticipated to expand at a significant pace during the forecast period. Expansion of the market in the region is expected to be contributed by India and Japan, due to the rise in the geriatric population leading to the increase in prevalence of infectious diseases owing to the weakening immune system. Key companies operating in the global multiplex assays market include Luminex Corporation, Thermo Fisher Scientific, Inc., Seegene, Inc., Meso Scale Diagnostics, LLC., Abcam plc, Bio-Rad Laboratories, Inc., QIAGEN N.V., Merck KGaA, Quansys Biosciences, and Illumina, Inc. 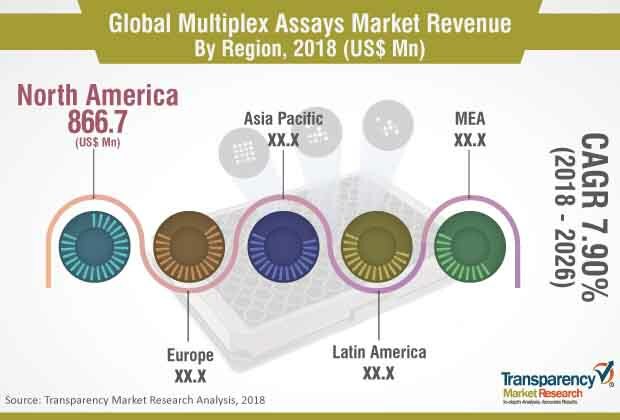 The global multiplex assays market report comprises an elaborate executive summary, which includes a snapshot that provides information about various segments of the market. It also provides information and data analysis of the global market with respect to the segments based on product, technology, type, application, end-user, and region. A detailed qualitative analysis of drivers and restraints of the market and opportunities has been provided in the overview section. Additionally, the section comprises competitive matrix and company profiles along with business overview to understand the competitive landscape in the market. This section of the report also provides market attractiveness analysis by geography and market share analysis by key players, thereby presenting a thorough analysis of the overall competitive scenario in the global multiplex assays market. In terms of product, the global multiplex assays market has been segmented into instruments, consumables, and software. The consumables segment has been further categorized into reagents & kits, micropipettes and microplates, and others. Expansion of the consumables segment is primarily due to repeat orders for reagents and kits. Additionally, the market has been segmented based on technology, type, and application. Based on end-user, the global multiplex assays market has been classified into biotechnology & biopharmaceutical companies, academic & research centers, diagnostic centers, hospitals, and others. The biotechnology & biopharmaceutical companies segment is anticipated to expand at a significant CAGR during the forecast period. The market has been analyzed based on price variations, technology trend, and presence of key players. The market size and forecast for each of these segments have been provided for the period from 2016 to 2026, along with their respective CAGRs for the forecast period from 2018 to 2026, considering 2017 as the base year. In terms of region, the global multiplex assays market has been segmented into five major regions: North America (the U.S. and Canada), Europe (the U.K., Germany, France, Spain, Italy, and Rest of Europe), Asia Pacific (China, India, Japan, Australia, and Rest of Asia Pacific), Latin America (Brazil, Mexico, and Rest of Latin America), and Middle East (South Africa, GCC Countries, Israel, and Rest of Middle East & Africa). The market size and forecast for each of these regions and the mentioned countries have been provided for the period from 2016 to 2026, along with their respective CAGRs for the forecast period from 2018 to 2026, considering 2017 as the base year. The research study also covers the competitive scenario in these regions. The report also profiles the major players in the market in terms of attributes such as company overview, financial overview, product portfolio, business strategies, and recent developments. Key companies profiled in the global multiplex assays market include Luminex Corporation, Thermo Fisher Scientific, Inc., Seegene, Inc., Meso Scale Diagnostics, LLC., Abcam plc, Bio-Rad Laboratories, Inc., QIAGEN N.V., Merck KGaA, Quansys Biosciences, and Illumina, Inc.